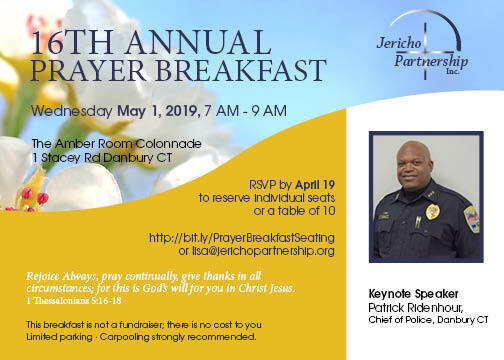 Greater Danbury Prayer Breakfast 2019 - Jericho Partnership, Inc.CommitChange | We help organizations raise more money, more sustainably. Join 500+ leaders in government, education, civil service, healthcare, business and clergy to hear an inspiring message from Danbury Police Chief Patrick Ridenhour, and lift our community's needs before God. This inspiring morning - featuring a lovely breakfast at The Amber Room Colonnade - is our gift to our community and is offered at no cost. Join me and donate to Greater Danbury Prayer Breakfast 2019.